Open a named page in the playground. Selecting a link that points to the same playground page as the one containing the link has no effect. For example, in the screenshot Overview.playground is the first page and Adding Files.playground is the last page. Replace spaces in the name of the playground page with the ASCII character code for space (%20). The markup below is for a named page link that opens a playground page called Adding Files.playground. 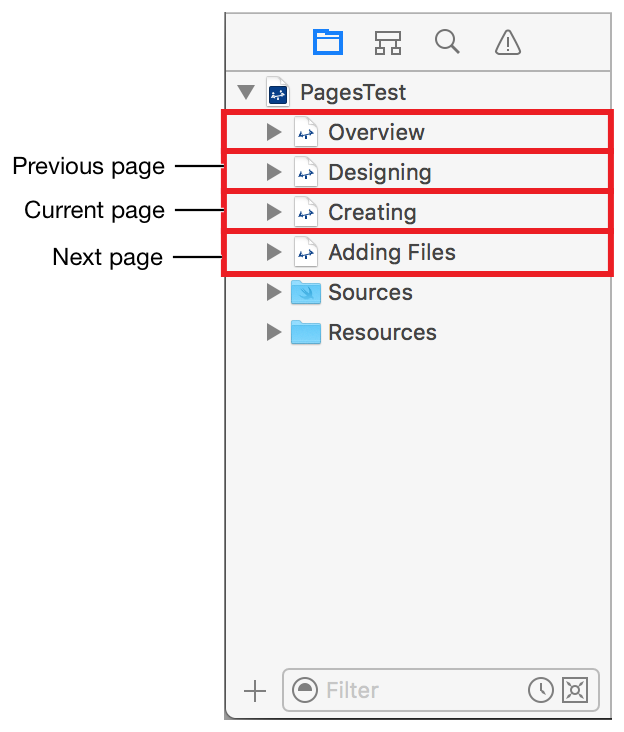 The named page link is rendered as a link with the text "Adding Files" in rendered documentation, as shown in the screenshot. You can use named page links to build a table of contents. Lines 4-6 below are links to different pages. Each link is an item in a numbered list. In the screenshot below, line 4 of the markup renders as link to the file Designing.playground named "Designing Your Tutorial." Lines 5 and 6 render as list items two and three.